Good joke. But like a lot of jokes, there was a certain amount of truth in what Harry said. Had Jim chosen to spend his life in Boston or New York City, there’s no doubt he’d have been busy all the time, playing with some of the biggest names in jazz. But Jim chose instead to live in his rustic cabin in Hanover, Maine, a very small town near Bethel. On the Seacoast, Jim Howe is best remembered for his role in the Tommy Gallant Trio, of which he was an original member, and for his presence in that group on Sunday nights at The Press Room as a sideman for some 20 years and then, when Gallant died, as leader of the Jim Howe Trio for another nine years. 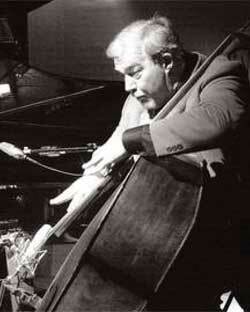 Jim grew up in Old Town, Maine, where he began playing the upright bass in the sixth grade. After graduating high school in 1964, he went on to the University of Maine in Orono, where he continued his music studies, established a reputation for his musicianship, and performed with the Bangor Symphony Orchestra. Jazz, of course, was Jim’s first love. And, once out of college, he moved to Boston, where he soon became an active player on the city’s jazz scene. After a few years of that, though, he came back north and played at the Mount Washington Hotel in Bretton Woods, New Hampshire. Not long after that, he took on a new role, teaching band and music classes at Parkside Junior High in Manchester. It was some years after that that Jim made his move to the Seacoast, establishing himself in Portsmouth, and playing regularly at The Press Room and, two nights a week, at The Metro, where he teamed up with pianists Paul Verrette one night and Paul Donovan the other. He also established himself in yet another career: as a professional photographer. The Jim Howe Photography Studio was a fixture on State Street for many years. In 2000, after an illness, Jim gave up his Portsmouth residence and moved two hours away to his cabin in Hanover, Maine. He commuted regularly from there to The Press Room, The Metro, and to Phillips Exeter Academy, where he was an adjunct instructor. The Seacoast jazz community was shocked on October 13, 2007, when Jim Howe died at the age of 61. On September 30, 2014, seven years after Jim’s passing, the faculty of Phillips Exeter Academy—his colleagues and friends—will remember Jim Howe with a concert in his honor in Phillips Church, at the Academy. And, by the way, Les will be on the bandstand.